Isometric Exercises are another fantastic form of bodyweight training with a bit of a twist. When performing a proper isometric movement, the joint angle or muscle length do not change when the muscle contracts. This means that if you were to watch someone performing an isometric routine, it might appear as if they are not doing anything at all. In reality, however, they are actually performing one of the best exercises you can do. press, there is only a fraction of a second in which all of the muscle fibers are being used to maximum effect. This is in direct contrast to isometric routines in which it's possible to work all of the muscle fibers at once for up to 10 seconds or more (provided you put in the effort, of course). Bodyweight training with isometric exercises will stimulate the creation of new, lean, muscle tissue. This will help to increase your metabolism so that you will burn more calories and loose weight more easily. For individuals who are older, these kinds of exercises are ideal as they will help to build up the density and hardness of the bone. This is something everyone should pay attention to, particularly as you get older. Isometrics teach your body to use more muscle fiber for each movement. So, it not only builds muscle, it also allows you to use more muscle efficiently. Out of all of the exercises you can do, isometric training is probably the safest. It doesn't use any awkward movements or weights, and is always perfectly fit for the individual. Here's what I mean by this. 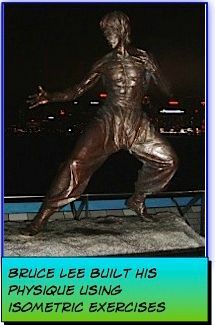 If you're Bruce Lee, you are probably going to be able to generate some fantastic force performing any isometric movement. If you're a senior citizen who hasn't exercised for a long time, however, you will probably not be able to generate anywhere near the power that Bruce could (but really, who can?) Still, you'll make progress and get stronger as you will be performing the exercise with a tension that is perfect for you. The fact that you are using your own body and muscle ensures this. All in all, isometric exercises are a great form of natural bodyweight training. Click on the links below to learn more. NEW! - POWER ISOMETRICS - The Ultimate Training Course - NEW! If you want to get experience all the benefits of isometric training you will want to read about my full POWER ISOMETRICS training course. With fully illustrated course material as well as two DVD's this program can get you on the road to optimal health in no time. Click HERE to watch an Audio/Video Presentation for Power Isometrics. Click HERE to read more. Isometric Strength Training - The Secrets Of The Old Time Strongmen Revealed! At the turn of the last century one of the most popular vaudville and circus acts were the strongmen. Many of them, such as Alexander Zass, could perform feats of strength that have not been replicated to this day. How did they train? Many of them used isometrics exclusively. To learn why read on. Isometrics can be an incredibly effective form of exercise. However they do need to be performed correctly. This article provides a couple of very important tips that will not only help you get the most out of isometrics but out of other forms of exercise as well. Charles Atlas was one of the main advocates for exercising without weight lifting. However many people claim that Atlas was a fraud and built his impressive physique by weight lifting. What is the true story? Isometric & Isotonic Contractions - What's The Difference? Isometric and Isotonic Contractions are both very beneficial, but different. What exactly are they, and what are the benefits and drawbacks of each? This exercise originally came from Charle's Atlas's original mail order course. Although it is not an Isometric exercise, it really works your chest and shoulders. For a complete course on these kinds of dynamic isotonic exercise check out "Power Isotonics". Give it a try and find out for yourself. If you want to try some isometric exercises for yourself, here are some you can try. Make sure you try the first one, as it really demonstrates how crucial it is to use your mind when performing these exercises. One of the muscle groups that most exercise programs ignore is the neck. This is a mistake, as as strong neck is vital for continued youth and vitality. This page presents some isometric exercises that will help you build a strong neck. I recently purchased Paul O'Brian's ebook of Isometric Exercises entitled "7 Seconds To A Perfect Body". What did I think of it? Click here to read my review. When people think of isometric training, they often think of Charles Atlas. However, the Charles Atlas course is not a true system of isometric training. Nonetheless, it's a classic. Click here to read my review.